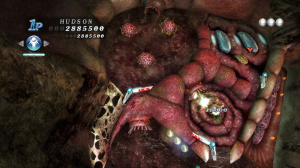 Over the years, the original Turbografx-16 Alien Crush title has become quite the cult favourite among classic game fans, so it certainly comes as no surprise that Hudson's decided to give this classic a fresh new look and feel in an effort to create a modern pinball game for the WiiWare service. 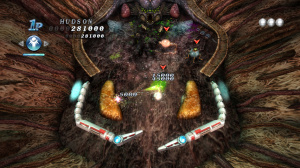 Hudson has taken the addictive pinball-style gameplay of the Naxatsoft-programmed original and created a brand new gaming experience around it, complete with updated visuals and a host of new options. But does this 15-year old pinball simulation still have what it takes to stand out and can Hudson capture lightning in a bottle once again? 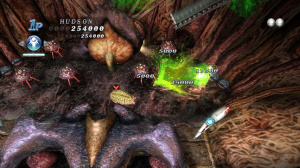 While Hudson has managed to inject a host of new play control ideas into the title, at its core, the game remains similar to the original in many ways. The same simple pinball action is intact, but this time around there are a few new twists that attempt to add depth to the overall experience. You still command the many flippers located around each stage, but this time you take a more active role in how the pinball reacts during play. There are also a host of new gaming options to add even more variety. Its small touches like these that provide a more modern appeal and added replay value. 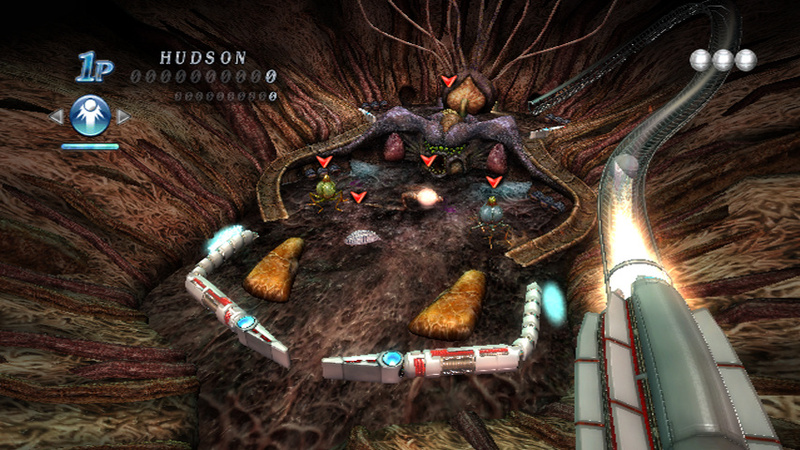 When you begin the game, you're presented with several different modes to choose from. 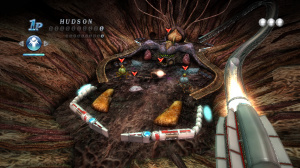 Story Mode allows you to play through each stage, each of which comes with its own unique segment of the plot to carry it along. Your task in each stage is to destroy each of the designated alien targets. At various points you'll also be forced to take on one of the alien bosses, which you must target with your pinball at its weak point. You control the game using both the Wii Remote and the nunchuk attachment. One button on each controller works a corresponding flipper while the other button controls the action ball power up. You can then use either the nunchuk stick or Wii Remote D-pad to toggle between the various types of action balls. Arcade Mode strips away the story line and boss fights and allows you to take on one of the three stages where the only goal is to rack up as many points as you can before losing all of your reserve pinballs. At the end of the game, you'll get to see where you rank on the Wi-Fi leader boards for each stage. This mode is basically for those who want to get right into the traditional Alien Crush pinball action. Next up is Versus Mode in which you take on a friend or up to 3 other players via the Wi-Fi function. When you play the game online, you establish a session in which you can choose to play a Worldwide Match with players from around the world, a Regional Match with players only in your area, or a Friend Match with any of your Wii friends. Once the desired number of players are accepted into the session, each player may select a specific stage to play. The majority wins, and the stage most chosen will be the one played. If it comes down to a tie, the stage is automatically chosen for you. Once the game begins, it's a race to 10 million points and the first player to reach that mark wins the match. While it can take awhile to get the session started, once play starts the Versus Mode plays like a dream and can be quite intense when you have four players racing to 10 million points. If you like multi-player competition, this is your game. It's nice to see that Hudson decided to keep the classic feel of Alien Crush intact in this remake, but the new additions also add a lot to the overall package. 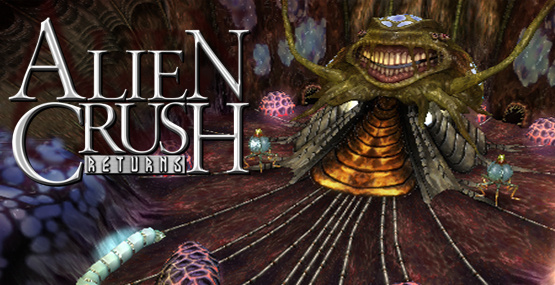 Unlike the original Alien Crush, this time you get to make use of your pinball in much more creative and useful ways. You have an action ball gauge that slowly fills up as your ball strikes objects around each stage. Once the gauge is full, you can then press the "A" button to turn your pinball into an action ball. There are several different types of action balls, each with their own distinct characteristics. The boost ball increases the speed of your ball and also makes it more powerful. This ball can be especially useful for taking out the various alien targets or quickly racking up a lot of points. You also have access to the reverse ball, which can immediately change the direction your pinball is travelling. Last but not least is the split ball, which will temporarily split your ball in two and allow you to cause twice the damage around the board. You can easily switch between these various balls using the nunchuk stick or the D-pad on the Wii Remote during play. Bring all of these new game play twists together and you'll find that Alien Crush Returns actually has a lot of depth to it, especially when compared to the original. The visuals, however, are a mammoth step up from the Turbografx-16 ancestor and are even impressive by WiiWare standards. The organic look of each stage makes the levels really come alive and everything tends to animate and pulse, giving the added impression that everything on screen is really alive. As creepy as the original's visuals were, Hudson have really outdone themselves with the spooky touches in this remake. There's also a lot of variety between the stages to keep things from becoming too repetitive. As if all of this weren't enough, the bosses are equally impressive. Not only are they huge in size, but they're also extremely well-animated and lifelike in both look and feel. It's clear from the moment you begin playing the game that Hudson given this game the same attention to detail as was lavished by Naxatsoft on the original. It's a real sight to see. Nevertheless, it was the music in the original Alien Crush that was probably its biggest selling point, and it is the one aspect of the game that most classic Turbografx-16 fans tend to mention when the game is brought up. While the new tracks aren't quite as moody, the music quality is better and has a much more modern sound to it. The sound effects further add to the audio experience and there are absolutely tons of different effects spread around the game. If you want to give yourself (and your neighbours) a real treat, you can select Surround Sound from the options menu and fire up the Dolby Sound System to hear some of the best Pro-Logic II sound the WiiWare service has seen to date. Not only will it shake the walls, but it also adds an even creepier aura to the entire experience with its pulsing sound effects. It would be easy to get caught up in the game's eerie visuals, but Alien Crush Returns is also a game that needs to be heard to be fully enjoyed. 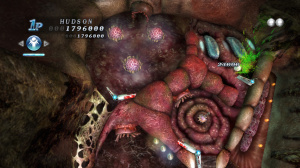 With Alien Crush Returns, Hudson has somehow managed to retain all of the unique and addictive elements of the original game while simultaneously adding in enough fresh game play ideas to bring the cult classic properly up to date. 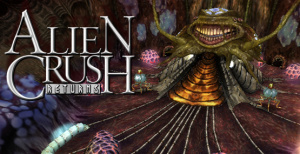 While the game is a bit on the short side and doesn't feature the type of depth some gamers might be looking for, it's difficult to deny that Alien Crush Returns is everything an Alien Crush fan could want out of a remake; the only problem is that it just leaves you wanting more. Hopefully the downloadable content will help alleviate that. So there is downloadable content? The only mention I see is in the last line of this review? @Corbie: Have you unlocked any DLC yet? My guesses about the download content are to give the game some extended life. All content out the door and people set high scores and possibly get burned out. Slowly rolling out tables or whatever and it allows people to try each as it comes. What I'd like to know is why'd they even bother making content downloadable(why not include it already)? Unless the content isn't ready yet. I've heard they made it free. So that's good. Great review, I'm downloading this as soon as I get some points. I wonder how long people are playing this. Is everything pretty much found right away (Other than downloadable content) Any secrets? Also how's it rate against the previous 2 games ac and dc? There is no DLC yet, it's just planned. I beat the entire Story Mode fairly quickly and I didn't open any type of DLC. So to my knowledge, no content is hidden. It deserves at least a 9! But nice review. The story mode was alot of fun, (at least facing the bosses) and they really did a great job. The multiplayer could have been a little bit better, but..
Other reviewers on this site have expressed discontent with the game. One even suggested buying the VC game before this one. So I wonder what Corbie likes that they didn't. I thought it would get a 9 as well. As for DLC, I heard about two new action balls: Exploding ball, and Paralyzing ball. @Crazynoodle: The leaderboards (high score and time attack) are very, very competitive, especially worldwide, in the high score leaderboard I'm 120th with 2280800pts for stage 1. As for time attack, I'm in 18th with 8:17.2 for stage 3. Will the downloadable content be free. I don't think I would want to pay for action balls. That would be stupid. This is good news. I'm broke, but I've got other games to work on until I can save up for this. Corbie, does this have rumble? I like how Metroid Prime Pinball had the rumble pack, and it seems like a good feature for a pinball game. That sounds fun, i always love leader boards with high scores, so it takes longer to getgood enough to work my way up. That also sounds good with the balls. Im gonna wait though, see what other content comes. @longtimegamer: I can't find the forum I read about the action balls, I believe it was on ign. They had pics as well, I don't know if they were photoshopped, but I'm sure there's more action balls. As for extra stages, they should release a remake of the original stage. That would be sweet! My main beef with the game is the lack of any palpable challenge, even in hard mode, especially when considering being able to use something like the reverse gravity action. After playing one match for the better part of an hour I just totally lost interest in actually chasing the high score. It felt less like fun and more like a chore. This is where the game fails majorly for me. It has little to do with skill and all the more to do with the player's endurance. About as equally fun has killing thousands of the same wild boars (and other assorted critters) in World of Warcraft. ZZZZZzzzzzz. Yes, the presentation is nice, but it doesn't save the game from being un-fun. I like pinball games, a lot, whether they're more inspired by classic arcade designs or consist of interactive tables. In the end, I can't recommend ACR to anybody. 5 in my book. added: Hows this stack up to other pinball games like metroid pinball and mario pinball? @Thanks for the link brazcan. I love this game. Im ranked 23rd in the world at 3rd stage time attack! I can't wait for the DLC. So far Hudson is remaining quite silent about the DLC and pricing other than the new balls. No one knows anything else. I've heard mention of new stages, but that has yet to be confirmed yet. And yes, there is rumble support. I should have mentioned that, sorry. @AlexSays-So far WWW is more generous with overall score when it comes to games that others criticize for their length such as this, Strongbad, and especially LostWinds. I have to agree that sometimes less is more if the gameplay is good. Great review, I agreed with every bit of it. My only gripe with the game so far (still in keeping with this review) is the music. The music is good, but not nearly as sinister or as imposing as it needs to be. Of course the updated sound quality of the music is better here, but the scores to the original Alien's Crush and Devil's Crush were more complimenting to their 16 bit counterparts than the music found in ACR is to...well, itself. Great review differently some to considur . So far my money tight with world tour which be out here in Australia next week but still something to considure . While we're comparing versus mode high scores...I am ranked 10th in America for stage 3! Sure there's only like 12 entries there right now...but still! On VC I opted for Devils Crush instead of Alien Crush. This wiiware version has me intrigued. Wonder if DC will ever get an upgrade. If this one does good enough I bet it will! Thanks for the review, i think im going to give this one a miss though! The comfirmed DLC of new action balls sounds like it is enough to reignite possibly stale high score tables. The balls with totally rework potential stratagies. Maybe an accelerated way of getting the DLC out the door is to get the high score tables to remain fairly static. Hudson have clearly learned from their first high score game; Star Soldier R.
Still one for the maybe pile for me at the moment though (Art Style and Toki Tori come first). Well this is not a game that will appeal to everyone, and I think that's made clear by the varying opinions on the game. Even some that liked the original don't care for this new version. I'm like some on here, I'd love to see a Devil's Crush Returns as I've always thought Devil's Crush was a better overall game than Alien's Crush. I totally agree with you about the rumble feature. I was playing for a while when I suddenly became aware that I kept feeling the rumble but only on my right hand. After realizing this, it was all I could think about. I spent the rest of the gaming session wishing the nunchuck had a rumble feature as well. Are there any hints of future DLC towards the end of the instructions guide, as with Mega Man 9 and Final FantasyCCMLAAK? These gave me the information I needed weeks before certain packages came out. The instruction guide just says that there is DLC that gets unlocked after certain conditions are met. For the time being check out the link I posted. If anyone unlocks any DLC, let us know and we'll post a news item about it. Has anyone beat any of the 'mini bosses' hiding in the bonus areas? I have a feeling that beating them unlocks stuff. I've only seen the 1st stage mini boss (had him flashing red, then I lost my ball), it's a purple spider thing with one eye, anybody know if it's the same mini boss for every stage, or is it a different one? Gee Corbie at the rate you chaging your avatar the servers is going to crash even if its running Linus its going to crush . And Corbie one again great review a game for me to consider even as i yet to buy the Turbografx original . This game seems really interesting and the shortness of the game is the only thing that breaks the game's magic. Downloadable content couls make the game a but longer. I'd buy this in a heartbeat. As long as there's loads of objectives on each table I'll be happy just with score-chasing. I love the first one on VC. The instruction guide just says that there is DLC that gets unlocked after certain conditions are met. I'm still holding this means something like x amount of people having greater than y amount of score. Kind of like the PSO Maximum attack challenges (various awards to participants would be handed out after net number of kills had been reached). It seems strange that you unlock DLC. Surely releasing it all for a couple of hundred points apeice would have been a better choice for Hudson. Also: I forgot - does this have MadStone/Bomberman/Tetris Party style tournament(s)? Not a fan of the music, but the game is fun. I'm depressed there wasn't something more like the original game. I want this soooo much! but no wiipoints. Nice review Corbie as always. Edit: And great Thanksgiving treatment to Gregg. Only one player profile? quite an oversight in what is essentially a score attack game. Hope they'l fix that in a download soon! Anyways, downloading this one just the same. No matter to me as I'm the only one that plays my Wii most of the time unless mates come over. Downloaded this last night. It's great so far. The story mode is a bit short though. I don't like the "aliens" they look like woodlice, worms and maggots. There's none of the Geiger influence the original had. They should have called this "insect crush"
Secondly the WiFi mode seems to be very bad at connecting. you have to wait three minutes for it to find another player (it usually only finds one) and then it sometimes crashes whikle setting the game up. I'm also not impressed with the scoreboard. you have to load up the scoreboard every time you want to look at it (with more tedious waiting time while it connects, instead of the always there stats of Mario Kart Wii) and as stated its absurd that you can't so much as enter different initials if a different player is playing. The story mode is a bit of a waste of time and I'm not sure why they bothered with it. @Ouazegaga: I believe that all you have to do is press the plus button after playing (as you already implied you did). That's all I did, and it worked for me! woohoo, dlc finally came! Even though it's just a new action ball: tractor ball. @Brazcanman- What is tractorball and did you have to do something to unlock it? I haven't got this game yet(I heard only one person can have their name on this game at a time, but do you have to reset the game and score to do it? You should see some of the pinball tables in Williams Collection: snoozers. Tractor ball is an action ball that slows down time (matrix style) and puts a cursor on screen, you choose a target and the ball will "lock-on" and go after it. I didn't do anything to get it, I jusy turned it on and there it was. When it ACR came out, I played it constantly but I never unlocked anything. Then I thought that maybe it releases something every week on monday (I guess friday for Europe), so I turned it on, checked for updates, and there was a message saying "new content available for download, download now?" And there it was, tractor ball. It is a useful ball, but you got to play through story mode to 'activate' it. I can't wait for new stages. May have to get it. Haven't decided yet. To top it off, each table comes with clear instructions on how to play the table. Which was a real eye opener for me. I found that after playing PHoF:WC, my ability to play REAL pinball tables (even unrelated tables) was vastly improved. IMHO, the $20 that PHoF:WC costs is a much better value than Alien Crush Returns. ACR is fun and I'm glad I bought it, but it feels like a poor substitute after getting such deep exposure to the real thing. No trick shots, rollover targets, table goals, drop targets, etc. It's pretty much a task of keeping your ball in play for as long as possible. Which is fun in its own right (which is why I like having the game ), but not even in the same class as PHoF:WC. @thewiirocks: Hey, should I get the Gottlieb collection or wait til Williams is released here? I like the look of the Williams one. Also, does anyone know how to get into the bonus round on table 1 in AC Returns after you've beaten it once? @Outrunner - I've heard mixed reviews about the Gottlieb collection. On one hand, it seems to achieve much of the detail that makes Williams Collection great. On the other hand, complaints range from the tables being boring to missing the detailed instructions present in Williams. Soo... probably a toss-up. If you can find it cheap, it might be worth checking out. I know I'd pick it up if they sold it here in the states for cheap. However, it's important to keep in mind that the Williams Collection almost certainly dwarfs the Gottlieb Collection. Not sure if that helps, but there you go. Exactly what I was thinking. The Gottlieb tables look boring. That helps a lot. I'll wait for Williams. Thanks! I had to beat the story mode to unlock all of the actions, Then I got the new download and seen it was a new action I though GREAT!! I went to arcade mode and noticed it was not there. So I did what ever gamer would do, I beat the story mode again and got the tractor ball. I really was tired after but had to try it out. All I got was a slow-motion ball nothing else. Will have to try this target select sometime tonight. One more monday, one more action ball: Explode ball! Good review, I DL'd it yesterday. I have a question, I'm not finding anyone online to try it out, is anyone else having the same luck? I have not even seen a new download for the exploder ball. Will have to try again.. I have played against 1 person online out of 10 attempts, keep trying..
No luck on unlocking the explode ball. Was there a new download today? Maybe the new download will trigger the explode ball to unlock? The latest ball is 'paralyze ball'... I'm sure you have to play one of the three tables to unlock this one too. I'm hoping they release a new table soon! Sorry abou the delay in the reply, I didn't unlock explode ball, my girlfriend did 3 days ago. She was just trying out the tables in arcade mode and there it was. I did the same as you though, playing story mode on easy, normal and hard. Oh, hey. I forgot to say what paralyze ball does: It electrically charges the ball for 10 seconds (i think) and the ball paralyzes the aliens it touches. French, Brazilian, Canadian or whatever... you're a gamer just like everyone else here. On top of that, you're as fanatical about ACR as I am! That's sweet! I'll keep you informed every week before friday as the new DLC comes out so you know what to expect. Aargh I hope it picks up too. I only have the first three action balls, so I'll start unlocking these. Logged into ACR today and it gave me another update. Of course I was wanting another table (No such luck). I does what it says it will do explode causing an area effect. My first thought is this would be great on the bonus room that is until I tried it.. It does blow your ball up so in fact it does it to the point where you will loose the ball, still looks kewl. I think Devil's Crush is a more well-rounded pinball title and it's easily the one most TG16 fans prefer of the two. That being said, I myself prefer Alien Crush mainly because it was the first game I bought the day I got my Turbografx-16 console when it was released here in the US. And truth be told, they're both so good, it's really difficult to pick a favorite anyway. Thanks for your reply Corbie and keep up the good work! No problem. Hope that helped you out. Playing against others is quite fun ... however more often than not, there are nobody else available to play. I hope they will tune this type of feature in future games, had they connected earlier to show people waiting to play in the main menu, I would go for it more often. No new action ball for this week? I was hoping for something new. Hey, does anyone know how to change the name in Alien Crush returns? Ya, I'm a little late on the new DLC... the semester is finishing and I got lots of tests / papers to mark. Anyways, the new DLC is yet another action ball: "trap ball". I havn't had the chance to unlock it yet... too busy. Maybe you can tell me what it does when you unlock it, I'm sure you'll unlock it before me.... havn't actually played anything on wii for days! Do you think I should get this or Rotohex, I'm not sure which one to get? I got ACR earlier, It's great! I haven't got any of these downloadable ball's yet, and I've played arcade on all of the stages! Oh ok, I got to the last boss earlier, so I will finish that off later. WHY I can't send my new highscore on the leaderboard??!! When I'm connecting to the CWF I just see my old and bad score instead of the new one....and this case appears on every arcade stages with a new score! So...WHY? If i can't send my scores the game's appeal down to zero (until the extra stage comes). ...oh yeah and my wifi connection works very well. Well, i got good news and bad news about this weeks dlc. Good news: its not a new ball, its a new stage. It's a fairly simple table with lots of aliens to kill and it has some loungish music instead of the hard techno. Oh, and theres a big eye that opens if you hit it enough times. Bad news: it's only playable through story mode after you kill the last boss (as far as I know). Hopefully next week will be a new 'arcade' table. Oh well, a new table is a new table. EDIT: in case anyone was wondering, the new table doesn't use more blocks in the wii system memory. I try this with a game over in the arcade stage but it doesn't work again....that would be mean......I will NEVER put my highscore because i don't send it in the right time? Good news for the new table. Well...I beat my highscore BUT i forgot to send this to the CWF right after the lose screen. So, i wasn't worried about that, i thought i could send this anytime through the ranking mode. arf...When i made this score i was in a good day. Now it will be very hard to recover this score........very very hard.....i'm cursed. hopefully i love this game so....this is a good reason to come back on the arcade stage. Ready for the next tables. This extra level is good for scoring. If they allow you to download the new level to Arcade Mode, they will have to update their online rankings to include level 4. They would probably also have to update vs. mode to include this level. Keeping my fingers crossed!!
'" "STORY MODE" has a total of 6 stages, including the bonus stage. Extra stages are available through Wi-Fi download! Defeat the aliens that stand in your way to complete every stage! Three stages are available in ARCADE MODE. Aim for the High Score and the Top Ranking!" So there are now three difficulty levels for Story Mode? Normal, Hard, and Insane? Obviously I would have preferred a new stage, but I was hoping for a new difficulty level, so hopefully there is a noticeable difference between hard and insane. All this amazing free DLC!?!? And I hesitated to get this! That's it, I'm getting ACR this week!! Looks like I'm not missing anything good since I left my wii... there better be extra stage for arcade mode! BTW, thanks to those of you who have kept the information flowing on here. I bought it late, and regularly check this to get info on the game. So far it just let me unlock the extra stage. Next one (Insane mode I guess) for me will probably be around Thursday or so, and then Tilt mode shortly after. Overall, it's a pretty good WiiWare title. I have had that hapen with other DLC. For instance, with the bonus stage, I didn't have time to go through story mode. So in a couple days after downloading, I went to play it, and it had me D/L it again. After I went through story mode and the stage, and then saved, there was nothing. Then, after the 4-7 days or whatever, the next DLC was available. So I try to unlock or use whatever DLC I get that day instead of waiting. So, to round up, how much and what DLC has been released so far and how much does it cost altogether or is it free? I've been thinking about buying it for awhile but I'm ready to now. I just want to know without having to go through all the posts. The space is already allocated for it in the original game download as well, so while it may actually download, they're moreso "unlockables." So only one new table and only for the story mode....it's sad. However, it's always better than nothing. I can't believe that some people complain about the DLC, when there weren't half as many game sales as Hudson would've surely hoped, and all the DLC was completely free. Some people are just selfish, since Hudson could've decided "no DLC at all". At least they didn't pull a Mega Man 9 on us and charge us for all the little add ons. Now I know that it's just unlockable, well, that's just naff (and Professor Layton all over again). Ah well, at least it's better than nothing I suppose, even if it is a bit ridiculous. And, I suppose it gets gamers to keep on playing - truth be told, I haven't played it much after the first week, although I do agree that it's a pretty good title. Professor Layton isn't the best example to use, bud. It's more like FFCCMLK!